Heaven and Hell will pay tribute to Ronnie James Dio with a special appearance at the High Voltage Festival. Vinny Appice, Tony Iommi and Geezer Butler will be joined by former Black Sabbath man Glenn Hughes and Masterplan's Jorn Lande for a set at the Classic Rock-backed event. The band had been scheduled to play the show before the recent passing of the legendary frontman. Tony Iommi said: "Ronnie's passing has left a huge hole, we hadn't anywhere near finished what we set out to do as a band together. He was so looking forward to the European tour and we hope this appearance will go some way to fulfilling that." 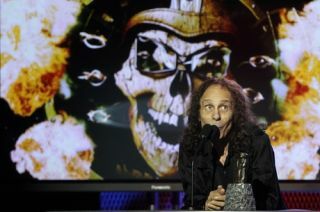 The band's proceeds from the show will go to the Ronnie James Dio Stand Up And Shout Cancer Fund.